A pin on corsage usually has every flower and leaves wired separately and then assembled together in a pleasing pattern. This detailed tutorial will take you step by step through the entire process. Please note that you should scale your corsage size to the size of the person who will wear it. 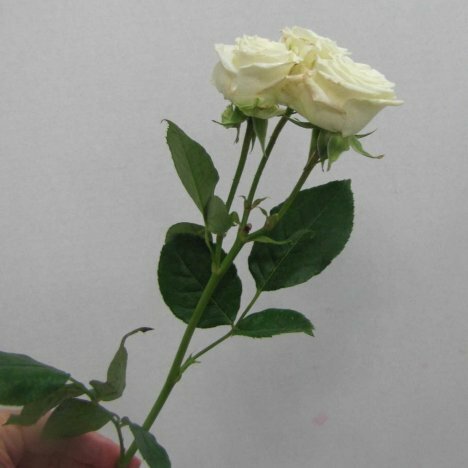 You may wish to use spray roses instead of standards for a smaller head size. Please feel free to substitute flower varieties or greenery or change to different colors. The basic instructions remain the same. 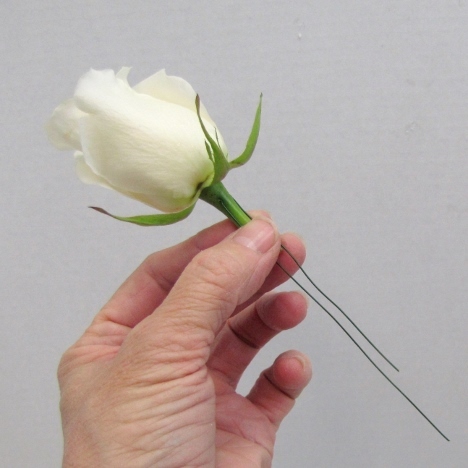 Spray roses have multiple headed stems (usually 3 - 5) and come in grower's bunches of ten stems. Always use a sharp knife to cut, as scissors can crush the cells of the stems. Cut the stem with a diagonal cut. 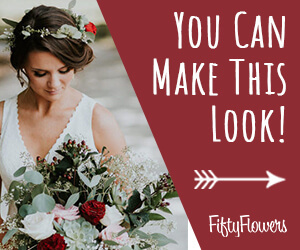 If you wish to make a corsage that is pinned on the wearer's shoulder, wiring the individual flowers and decorative components (such as ribbon, tulle, greenery etc.) is the most common way. 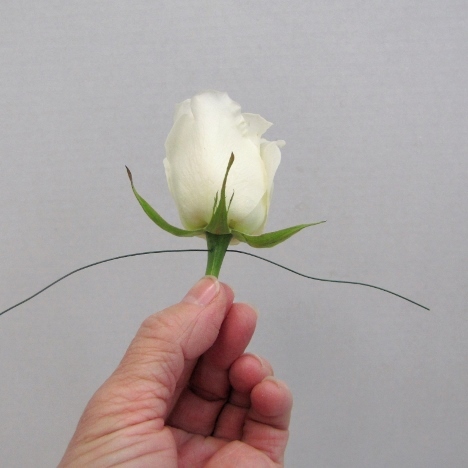 Roses are prepared for corsages by pushing a thin wire through the calyx (bulb) of the flower head and bending down to form a new, more slender and flexible stem. 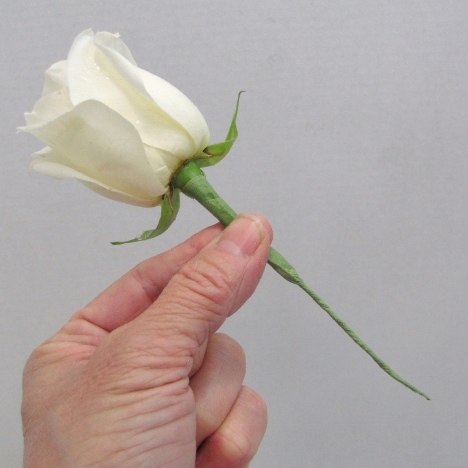 If you were to simply tape the flowers together using their original stems, it would be very stiff and inflexible, resulting in a thick and unwieldy stem. 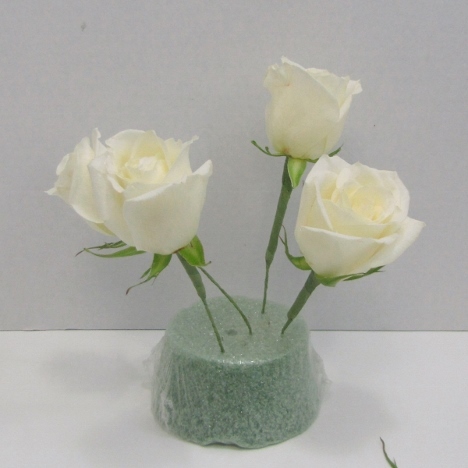 Use professional floral tape, winding it high under the flower head and pulling in a downward motion. This causes the tape to stretch and adhere to itself. Be sure to buy your supplies from a working warehouse or floral supplier. I was in town for a friend a few summers back when she asked for help in creating some corsages and boutonnieres for a local wedding. She had purchased her floral tape from a $1 discount store. It was a mess! The tape was sticky, gooey and made the job so much harder. Floral suppliers have a regular turnover of their products - which do sometimes have a shelf life. "Bargains" may not always be as great as they seem! I continue to wire and tape several more roses for my corsage. Keep in mind the size of your wearer. 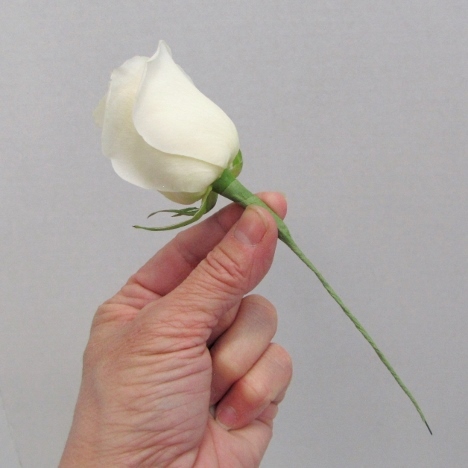 A tiny, petite person would need a smaller corsage - perhaps even considering using spray roses instead of standards. Roses should have a firm feel to the head. 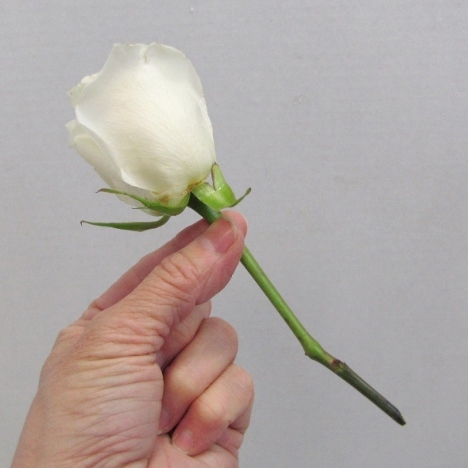 Loose petals can be a sign of aging and the corsage may not last long after it is pulled from the refrigerator. Cut the stems off short (about 1" to 1 1/2" below the calyx) with a sharp knife. 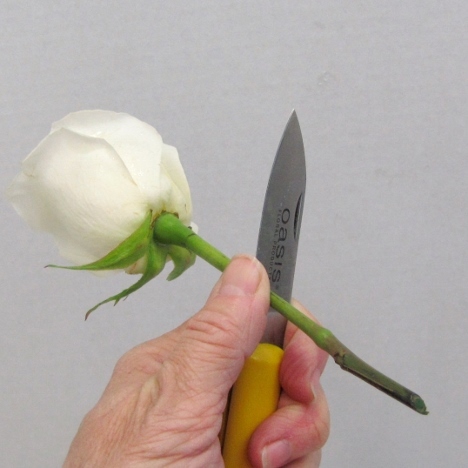 Scissors can have a hard time cutting through the tough, slippery skin of a rose. Be sure to remove any thorns. I keep a stiff base of dry foam close and push the taped components into it rather than lying the flowers down on a table surface, which can cause bruising of delicate petals.